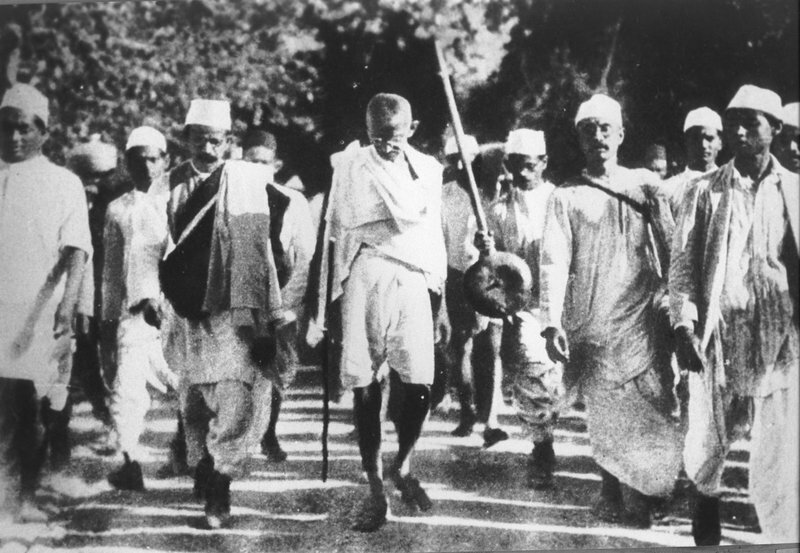 Gandhi during the Salt March, March 1930. Credit: Yann via Wikimedia Commons. CC0 Public Domain. Once again I’m thinking back to the 16th of February 2003. By that time, my own experiments with nonviolence had formed my lukewarm (at best) opinion of the marches and rallies currently in fashion. But February 16th was not a day to let skepticism reign. The Iraq War was imminent and people were taking to the streets. I knew I ought be among them. And, while I cannot claim that I stepped out on that winter morning with every bit of my hard-earned skepticism left at the door, I did step out. With an earnest and open heart, I stepped out. Downtown, I met up with a small group from my Quaker meeting. We wove among many thousands of our fellow San Franciscans, adding our voices to a resounding “no,” collectively and clearly pronounced in the face of the looming re-invasion of Iraq. It was an exhilarating day. It was a day of passion and purpose. Perhaps most dazzling and heartening was the knowledge that our voices were lifted in concert with millions of others the world over. Remember that? We were experiencing a taste of the immense potential of people and of the great underlying solidarity that bound us together. It was a marvelous day. And, it was one of the loneliest days of my life. The profound loneliness I experienced wasn’t simply a case of my skeptic shadow getting the best of me. On the contrary, it was the relaxed grip of my skepticism that opened me to the truth I encountered that day. In the painful isolation I had that singular experience of clearly seeing something for the first time that at some level I had known all along. Amidst the day’s exhilaration it was plain to me that something essential was missing—that there was, in fact, a gaping void at the very heart of it all. Deep down, I knew that this marvelous day was a day of certain failure. I knew that our massive mobilization to stop the war would inevitably and necessarily fade, and it would do so quickly. During the march, my eyes were invariably drawn by particular phrases scrawled on several of the signs and banners. And I couldn’t help but think of the person behind those catchy one-liners: Gandhi. Like every great prophet Gandhi is customarily placed on a pedestal. We revere him as a patron saint of nonviolence, a mahatma—the Sanskrit term of veneration meaning great soul—a larger-than-life figure we can never hope to fully emulate. We hold him at this comfortable distance, deeply impressed and inspired, while remaining free and clear from what he actually taught. Gandhi himself bristled at the thought of being called mahatma, doubting his worthiness of the accolade, and knowing well that such veneration would necessarily distract people from what he was actually doing. Gandhi urged his fellow Indians not to exalt him but to look at the nuts and bolts of nonviolent transformation. Over the last decade, I’ve seen my primary work as that of taking Gandhi down off the pedestal. I’ve studied him closely, including his teachings about Satyagraha, a term coined by him and variously translated as “truth force,” “soul force” or “clinging to truth,” generally used in reference to nonviolent resistance or a specific nonviolent campaign. I am committed to listen to Gandhi as a trusted guide with concrete instructions relating to my here-and-now, day-to-day life. Following February 16, 2003, this quest became particularly focused. I felt compelled to understand both the gaping hole I experienced that day and the nature of its possible remedy. I hoped Gandhi’s life and work would offer guidance. And in due time, I found this guidance in the space of a single paragraph penned by Gandhi at a critical point in his life. On February 27, 1930, two short weeks prior to launching the Salt Satyagraha, a pivotal episode in India’s struggle for independence from the British Empire, Mohandas Gandhi wrote a short article for a national publication. The article was called “When I am Arrested.” While the Salt Satyagraha has been the subject of immense interest to scholars and activists, this article appears to have gone mostly unnoticed. This is understandable, given the drama of the “great march to the sea” and the massive civil disobedience that followed it. The British, in order to maintain their monopoly on the salt industry, had prohibited any unsanctioned production or sale of salt. Gandhi defied British imperialism by leading a 385-kilometre trek to the Dandi seashore and lifting a now-iconic fistful of salt above his head in contravention of the salt laws. It stands as one of the most potent touchstones in the history of nonviolent resistance. Within this call to action I found the paragraph I believe we activists most need to hear. The paragraph refers to the ashram that was Gandhi’s home, a place where religious devotees lived, raised their food and worshipped together. It was also the starting point of the march to the sea. "So far as I am concerned, my intention is to start the movement only through the inmates of the Ashram and those who have submitted to its discipline and assimilated the spirit of its methods. Those, therefore, who will offer battle at the very commencement will be unknown to fame. Hitherto the Ashram has been deliberately kept in reserve in order that by a fairly long course of discipline it might acquire stability. I feel, that if the Satyagraha Ashram is to deserve the great confidence that has been reposed in it and the affection lavished upon it by friends, the time has arrived for it to demonstrate the qualities implied in the word satyagraha. I feel that our self-imposed restraints have become subtle indulgences, and the prestige acquired has provided us with privileges and conveniences of which we may be utterly unworthy. These have been thankfully accepted in the hope that some day we would be able to give a good account of ourselves in terms of satyagraha. And if at the end of nearly 15 years of its existence, the Ashram cannot give such a demonstration, it and I should disappear, and it would be well for the nation, the Ashram and me." What struck me that day in San Francisco, on the eve of war, was that we peace-minded folk were entirely unprepared for the battle at hand. Our so-called “movement” lacked the depth necessary to sustain it. It came as no surprise, then, to see that after the bombs started dropping, we returned, with few exceptions, to our lives—to business, “progressive” though it may have been, as usual. Though committed nonviolent practitioners dappled the crowd that day, the marching thousands were not grounded by the presence of a core group such as that which gave such depth to India’s independence movement or the civil rights movement, which drew heavily on Gandhi’s teaching and example. Try as we might to organize faithful and effective nonviolent resistance, if we proceed as though the battle doesn’t require that kind of depth, discipline and training, our efforts will necessarily continue to come up short. And where does such depth come from? In Gandhi’s article, “When I Am Arrested,” he offers us a valuable clue: 78 people prepared for 15 years. In community life, they underwent the training of spiritual discipline and constructive work of social uplift. Though they were the core of the Salt Satyagraha, those 78 did not carry it out on their own. The great power of that movement was many-layered, involving literally millions of individuals responding to the direction of a superlative leader. But the role of that core of 78 was essential to the Salt Satyagraha’s success and the ultimate success of India’s struggle for independence. If we want to truly benefit from Gandhi’s guidance here, we need to enter into a deep and soulful investigation of this ashram experience, and discover what Gandhi meant when he said that the Salt Satyagraha would only be started by those who had “submitted to its discipline and assimilated the spirit of its methods.” Gandhi calls for true transformation, a trading in of old lives for new. What is remarkable about Gandhi the teacher is not that he introduced novel concepts—he said himself that nonviolence is as “old as the hills”—but that he so deftly systematized the transformative work of building a nonviolent life, and that he did it in a way that can be effectively translated for our time and place. Gandhi’s approach to nonviolence, which was the foundation of his ashram communities, points us to interrelated, mutually supportive spheres of experimentation. Nonviolence scholar Gene Sharp notes three such spheres in Gandhi’s writings: personal transformation, constructive program (work of social uplift and renewal), and political action, prioritized in that order. At the heart of Gandhi’s approach to social change is his understanding that the building blocks of a nonviolent society are the vibrant, productive, nonviolent lives of individual women and men. Effective nonviolent political action does not spring from a vacuum; it grows out of daily living grounded in personal and communal spiritual practice, and in constructive service to one’s immediate and surrounding communities. Nonviolence on the political stage is only as powerful as the personal and community-based nonviolence of those who engage in it. The importance of the ashram experience flows from this understanding. This fundamental aspect of the Gandhian design almost entirely eludes us in our North American context. Here, we most often employ the reverse order of Gandhi’s threefold approach, seeking a political response first, the building up of a constructive alternative second and the stuff of all-out personal reformation third, if at all. This reversal allows North American activists of faith to sidestep some of the most foundational aspects of Gandhi’s nonviolent recipe: namely, radical simplicity, solidarity with the poor and disciplined spiritual practice. Because we do not believe nonviolence requires these of us, we miss the necessity of the ashram experience. No one can build a nonviolent life as an individual. I may be able to practice some measure of piecemeal nonviolence more or less on my own, but if I’m going to pluck the seeds of war from every part of my life that I possibly can, if I am going to renounce and abandon the violence of my first-world way of life, I need to be surrounded by others whose knowledge, wisdom and experience will complement mine, and whose example and company will inspire me to stay the course. The 78 members of Satyagraha Ashram who were the cadre of “foot soldiers” Gandhi chose to be the nucleus of the Salt Satyagraha were doing all of this for one another for a period of nearly 15 years. This prepared them for the high level of self-sacrifice that Gandhi foresaw when he said, “Not a single believer in nonviolence as an article of faith for the purpose of achieving India’s goal should find himself free or alive at the end of the effort.” Until faith communities embrace this level of commitment and clarity of purpose, it is up to those of us who feel called in this direction to seek each other out. We need to hold one another accountable to this magnificent charge. We need to manifest our shared strength and leadership. We need to move together toward the key ingredients in Gandhi’s nonviolent recipe—radical simplicity, solidarity with the poor and disciplined spiritual practice. As we walk that long, disciplined, grace-filled path we and our religious communities will be rightly stretched. And in time, I trust that we will be gradually readied for sustained nonviolent struggle. Syndicated from www.earthlingopinion.files.wordpress.com.This article originally appeared in Geez magazine. Geez is an independent quarterly Canadian magazine dealing with issues of spirituality, social justice, religion, and progressive cultural politics. A version of this article appeared in Friends Journal, April 2006.